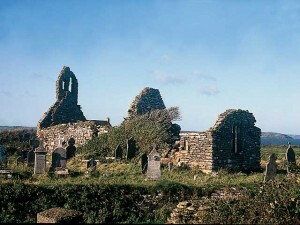 Monastery founded by St.Dubhan at Churchtown. 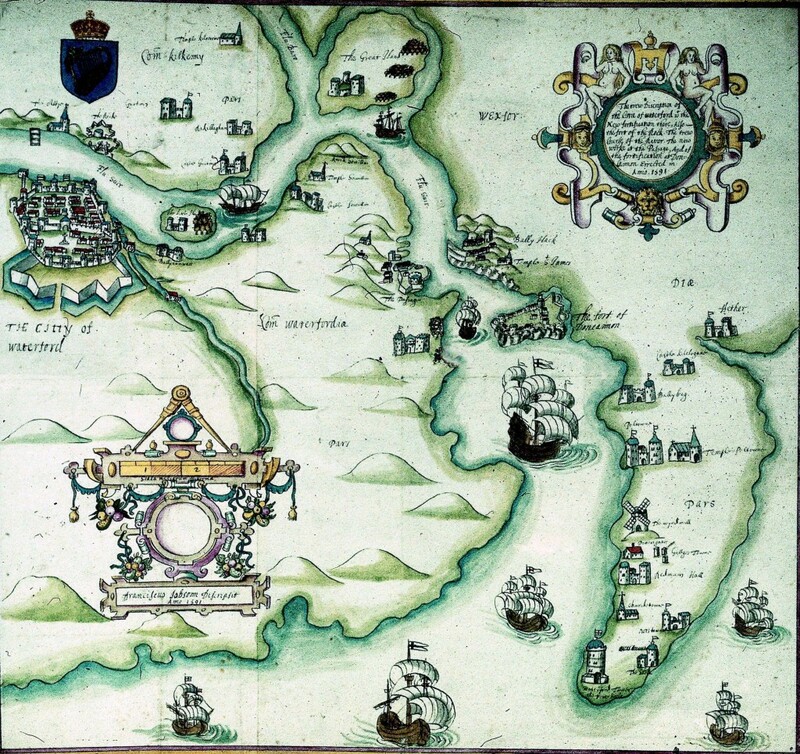 The peninsula became known as Rinn Dubhain (Dubhan’s headland). According to tradition, the monks kept a warning beacon to warn sailors of the dangers of shipwreck on the rocky headland. 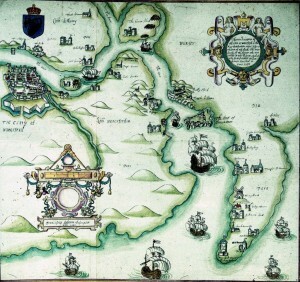 The landing of the Anglo-Normans in south Wexford. 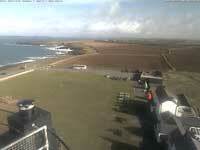 First landings at Bannow, Baginbun & Passage (all visible from Hook Lighthouse). They quickly took over much of the south and east of Ireland. Richard de Clare, Earl of Pembroke (Strongbow) became Lord of Leinster. Strongbows daughter Isabella married the powerful knight William Marshal who succeeded Strongbow as Earl of Pembroke & Lord of Leinster. He founded the town of Ross as the port of Leinster. In the early 13th Century, Marshal began to develop Leinster by bringing in many English tenants, founding towns & building castles. The tower of Hook was built by Marshal as a landmark & light tower to guide shipping to his port of Ross. The light was provided by a coal fire beacon. The many skilled castle builders employed by the Pembroke estate provided the necessary expertise. A large number of locals must have been employed on the construction. The first historical references to the tower in the records of the Pembroke estate shows that the monks from Churchtown had been installed as custodians (light keepers). Thirty acres of land near the tower were reserved for the use of the light keepers. Still known as “the tower lands”, they now belong to Loftus Hall. The monks presumably continued as custodians for several centuries, probably until the dissolution of the monasteries by Henry VIII in 1540. By the 17th Century, the light was no longer tended and numerous shipwrecks led to calls from sailors & merchants for the light to be restored. Hook tower (along with five others around the coast) was restored by Robert Readinge. He erected the first glass lantern to protect the coal fire beacon from the elements. Further improvements were carried out in the early 1700’s. In the late 1600’s, the tower passed into the posession of the Loftus family. In 1706, Henry Loftus leased the tower to the authorites for £11 per annum. The ground floor was used as a coal store but later in the century it was used by the military as a magazine for storing gunpowder. Following repeated complaints from mariners about the poor condition of the light, the coal fire was eventually replaced in 1791 by a lamp burning whale oil. In this year the tower was handed over to the Corporation for Preserving & Improving the Port of Dublin and £4,280 was spent on a new apparatus. The lantern was given its present shape. Three dwellings were built for the light keepers & their families. Three red bands were painted on the tower, these were later changed to black and the bands reduced to two. The body in charge of lighthouses became known as the Commissioners of Irish Lights. New gas lights were installed in this year, powered by gas manufactured in the gas yard. Paraffin oil subsequently became the source of power. A clockwork mechanism was installed to change the beacon from a fixed to a flashing light. The mechanism had to be wound up every 25 minutes. The light switched over to electricity. 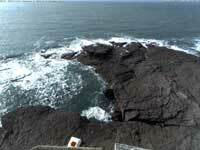 The Lighthouse was automated and the light keepers departed after almost 800 years. 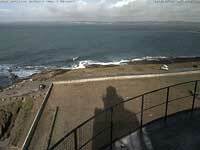 As well as the light a fog signal is operated at the lighthouse. For centuries a cannon gun was fired off the edge of the cliff during fog. This was replaced by a hooter, which in turn was replaced by rockets. In 1972 a foghorn worked by compressed air was installed. The foghorn was decommissioned in January.